As an executive who has served 12 years in local elected office, I can confirm that politics is an often thankless job, and that CEOs who approach the task with the idea that their management expertise will get the clunky wheels of government moving like a finely tuned machine will learn quickly just how hard that is. There’s no question that we have an overabundance of opinionators competing for airspace in the modern media environment. What we are lacking, though, are people who can move us forward, not with words, but with thoughtful actions and solutions. That’s where I believe highly qualified executives have a critical role to play in solving the problems that our country faces. It’s popular today to say that society is polarized, and it’s therefore too dangerous to wade into issues that pose risks to a company’s brand and reputation. But there are plenty of important public policy problems that lie outside the realm of red and blue. These are areas where an experienced executive can use his or her skills to have a meaningful impact. One such issue that I found success with is land preservation. When it comes down to it, people don’t fight a lot over the core benefits of preserving sensitive lands. Water quality, air quality, natural beauty and keeping congestion in check are not a tough sell. What is hard is the delicate balance between preservation and property rights, and that is where I found that the negotiating skills I’d developed in my years in business made a difference. I was able to help get the right people to the table talking in a productive way when others couldn’t, and today the 2,800-acre Crow’s Nest peninsula, just down the Potomac River from Washington, D.C., is preserved for public enjoyment. 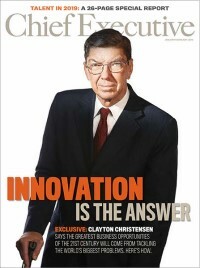 Working on this issue taught me the advantages that business executives can bring to solving problems that can bog down the government machinery. Perseverance, seeing things through, ensuring that all parties are treated professionally, and seeing the long-term impacts are just a few of the business skills I drew upon as we worked to negotiate a fair deal for all parties. Acting intelligently means communicating with the board of directors, weighing the risks and choosing issues carefully. Where can you truly have an impact (not just make headlines), and how could your actions affect the brand of the organization you lead? True leaders must take intelligent risks when they see a chance to move their community forward. The C-suites of America are filled with far too much brainpower to sit on the sidelines while our country works through complex problems in the coming years. Paul Milde is founder and president of CIP Finishes, a specialty construction firm that furnishes and installs interior hardware in large multifamily residential, commercial and related projects in Washington, D.C., Maryland, Virginia and other regions. CIP Finishes is based in Stafford County, Va.